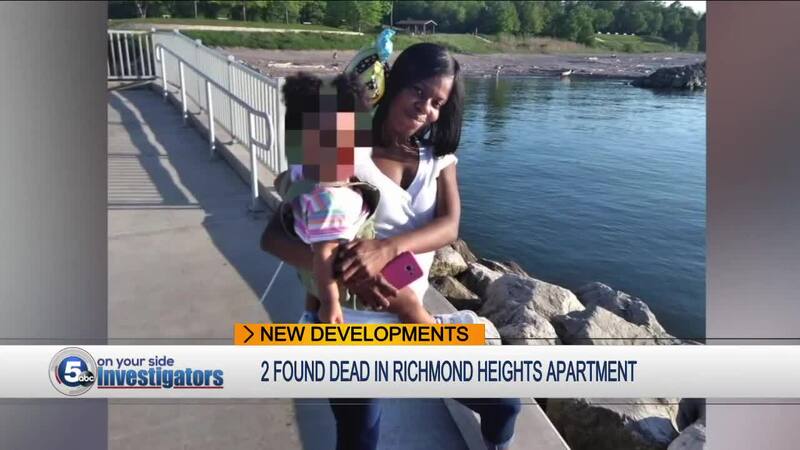 Police say they found a toddler next to her mother's body after what appears to be a murder-suicide Sunday night in Richmond Heights. Investigators think Joseph Debow walked into his girlfriend's apartment building, shot Annie Sims to death in front of the couple's daughter, walked outside and fired a bullet into his own head. "That was tough," said Richmond Heights Detective Greg Patterson. "The baby didn't want to leave her mother. Obviously, any time children are involved, it makes things that much more difficult." Police found Debow's gun next to his body. They say he was licensed to carry it. Sunday night was the first time police had dealings with the couple. But Sunday's night's shootings were the final chapter in what Sims' family painted as a stormy eight or nine-year relationship. "I just wish she would have listened to me," said Sims' sister Louise Sims. "I kept telling her to leave him alone." "She told him, 'After what you did to me, I don't want to talk to you no more,'" said Sims. "She was scared she could get in trouble," said Sims, "because sometimes she reacted too and did things to him. But I'm like, he's the one that did these things." The couple's 17-month-old daughter is staying with Sims' family.